Cetaceans are divided into two suborders: the Mysticeti (baleen whales) and the Odontoceti (toothed whales, dolphins and porpoises). The humpback whale (Novaengliae megaptera) belongs to the Mystocetes; humpbacks strain their small prey from the water using thick keratin plates called baleen. In the North, humpbacks are opportunistic feeders foraging on krill, herring, and other prey abundant in the nutrient rich waters off Maine, Newfoundland, Labrador, Greenland and Iceland. They consume massive amounts of food during the brief northern summer, accumulating the fat stores that will sustain them through the lean southern winter. 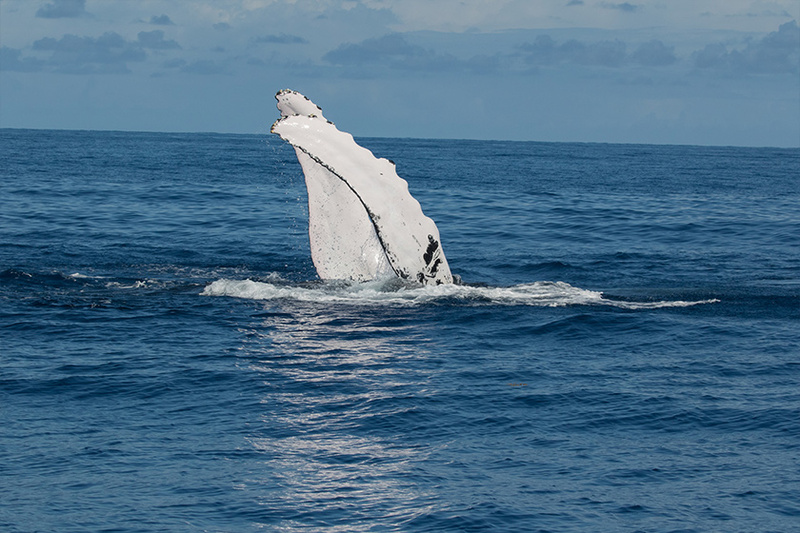 As autumn approaches, humpback whales from the western North Atlantic begin an approximately 1200 mile journey south, to the various calving and mating grounds located throughout the Antilles. 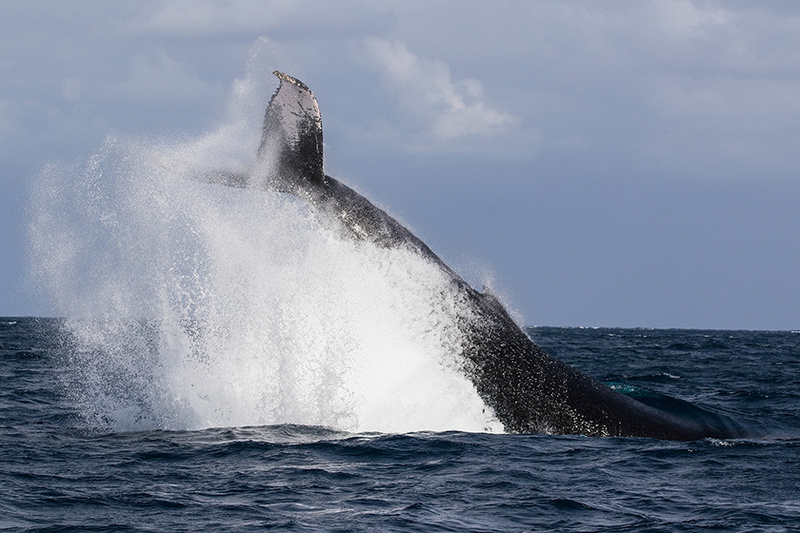 Heavily pregnant female humpbacks will give birth on arrival (following a 10-11 month gestation), while males will start to seek out and compete for willing partners for mating. 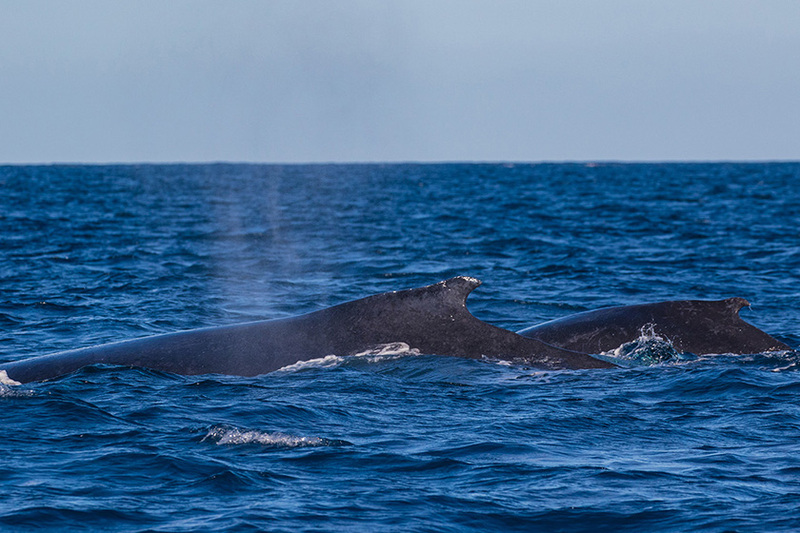 Female humpbacks do not tend to mate year after year, though they will come back into estrous shortly after giving birth; the drive to reproduce makes for a great deal of surface action as males struggle for proximity to estrous females. Males become extraordinarily vocal at this time too, and their plaintive songs fill the shallow seas. Humpback whales are renowned “acrobats of the sea,” with most of their surface behaviors on full display year round, though they are especially frequent and energetic in the southern winter. Spinning head breaches, chin breaches, tail breaches, fin slapping, lob tailing, spy hopping and sleeping postures are commonly seen. During the mating and calving humpback whale season, it is thought many of these actions are largely used as a form of solicitation and/or warning to competitors. Below the water, humpbacks are just as dramatic in courtship and tender in mothering, and both displays are thrilling to witness. 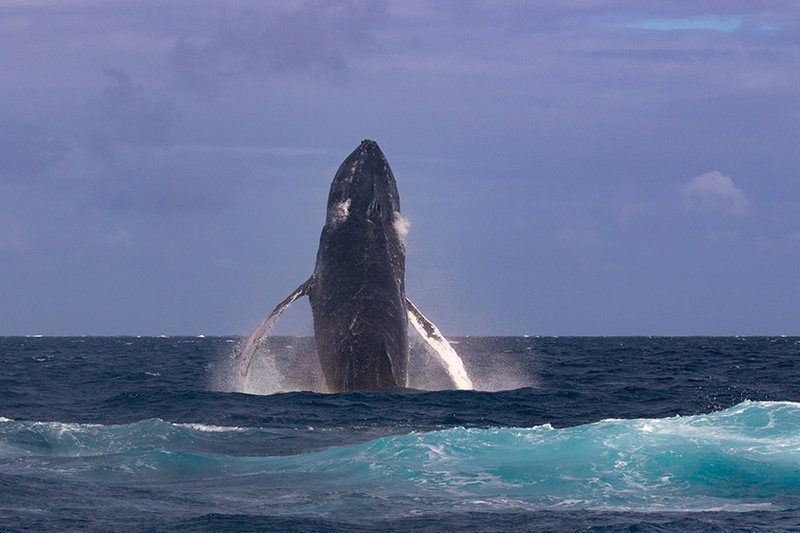 Combined with relentless high-energy rowdy group action an underwater chorus of whoops and whistles, humpback activity in the Antilles is frequent and exciting above and below water. When a whale rises through the surface of the water, it is known as breacihng. There are four types of breaches you will witness on your Whales of the Silver Bank Expedition: spinning head breaches, chin breaches, tail breaches and lunge breaches. 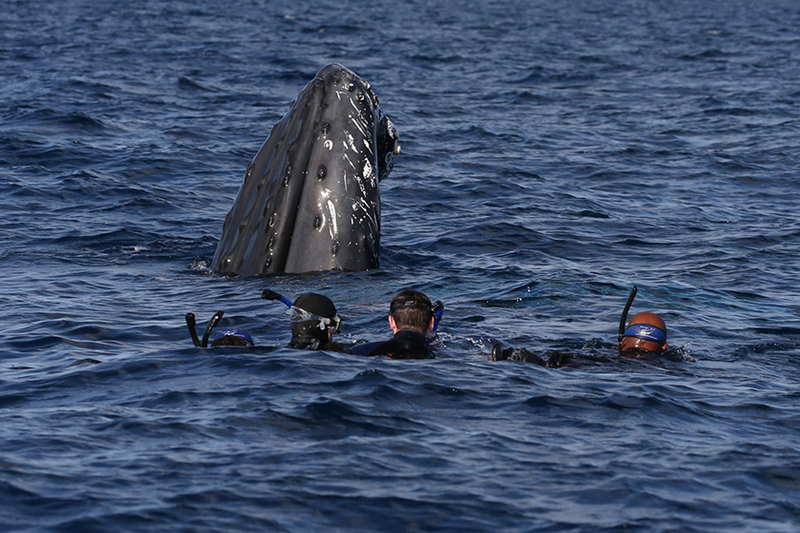 Breaching may be a form of solicitation, a warning device, a way of removing parasites, or just a way of having fun. In any case, it is certainly impressive to witness. 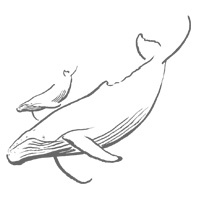 The whale raises its tail or fluke out of the water, and then slaps it down onto the water’s surface. It is typically repetitive, with the whale either lying on the surface flat out or head inclined in the water up to 180 degrees. 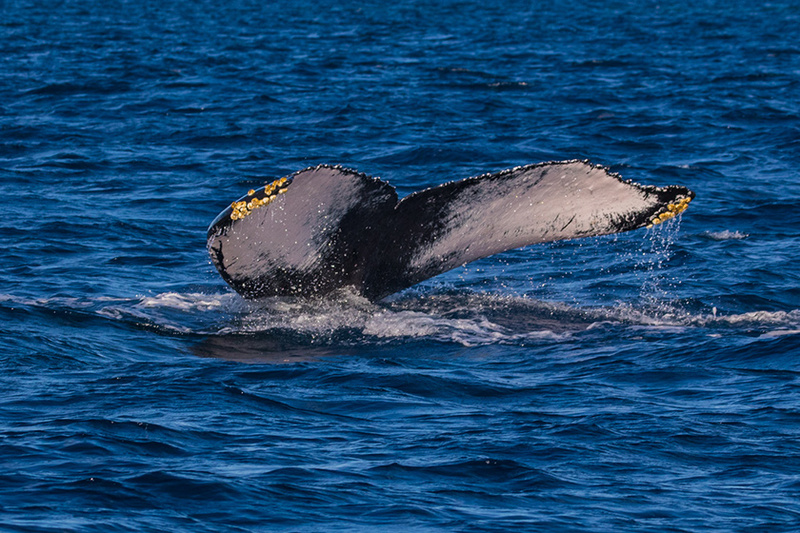 Humpbacks can lob tail using the ventral or dorsal side of the fluke, or switch back and forth without missing a beat. The whale lies on its side or back and raises its pectoral fin out of the water, then slaps its fin repetitively on the surface of the water. They may do this with one pectoral fin or utilize both pectoral fins simultaneously. A spy hop is when the whale raises its head out of the water, typically oriented vertically.  Presumably, the behavior is done in order to see, or otherwise determine, what is going on above the surface. Traveling whales will spy hop by turning on their side, exposing one eye above the surface as they go by. 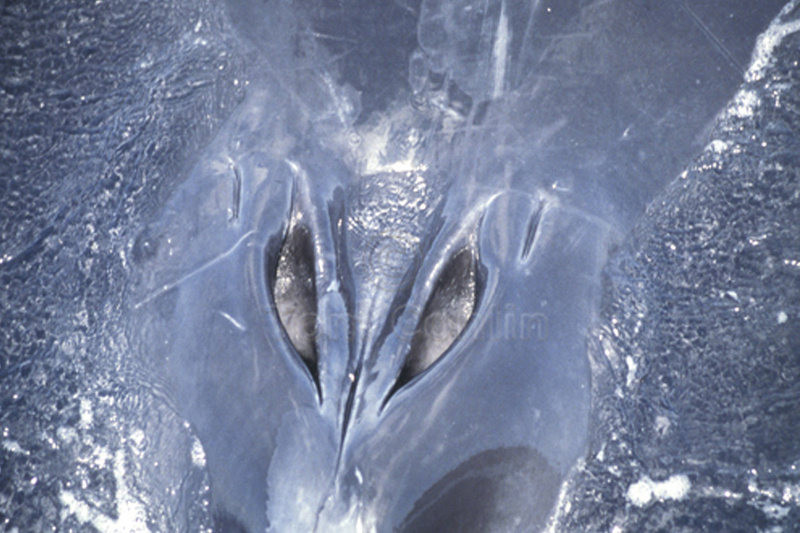 The blowholes are equipped with nasal plugs, which remain closed until forced open by respiratory pressure. 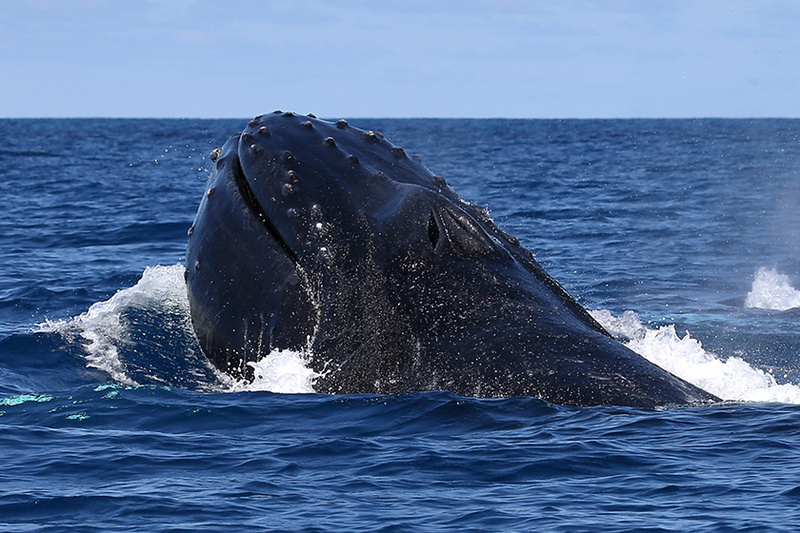 Humpback whales are voluntary breathers (as opposed to most land-based mammals, who tend to be involuntary breathers). During inhalation, a humpback will fill its lungs to capacity; with each exhalation they will expel 90% of the air in the lungs, forcing the air from the blowholes at over three hundred miles per hour. 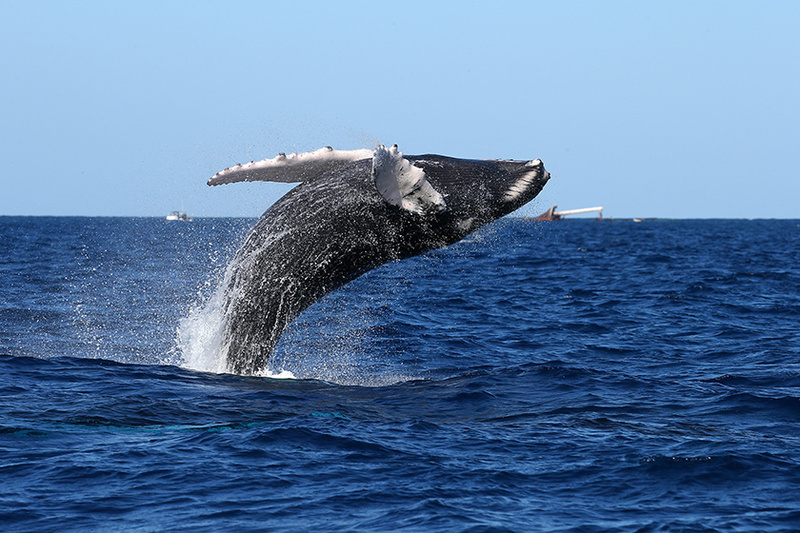 It is believed that adult humpback whales can hold their breath up to 40 minutes. 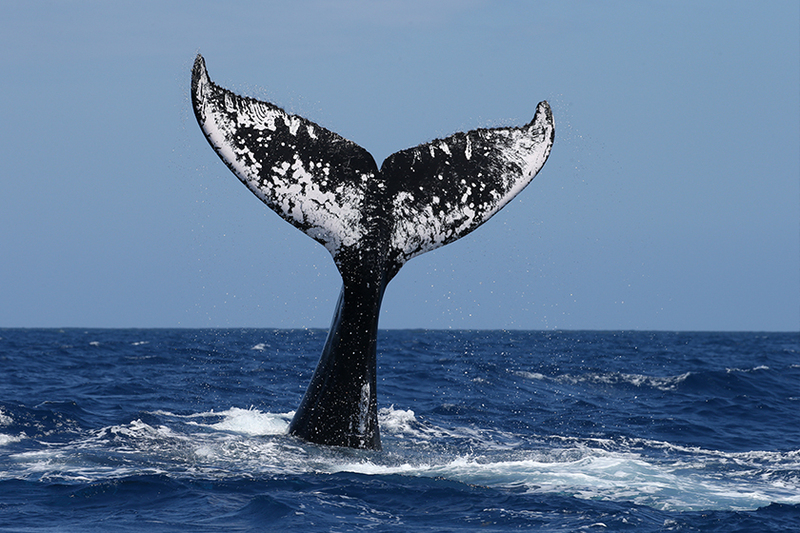 The fluke, or tail fin, of a humpback whale is very broad and flat, ranging in width from 10 to 15 feet. Attached to a muscular base known as the caudal peduncle, the fluke is capable of propelling the whale at over 12 knots for short periods of time. Flukes normally have a serrated edge, a deeply notched center called the median notch, and a variable pattern of black and white markings (used in identification of individuals). The term fluking refers to the action of raising the tail above the water in order to descend sharply beneath the surface. A rowdy, or competitive, group is when 2 or more whales (typically males) compete for proximity to a female in estrous. Rowdy groups are fast-paced (bursts of speed of up to twelve knots at a time), energetic and often violent chases, lasting from a few minutes to hours at a time. The dorsal fin is fleshy, consisting of cartilage, blubber and skin. When the humpback comes to the surface and arches its back, the dorsal fin and caudal peduncle form the hunched shape that lends the whale it’s common name. 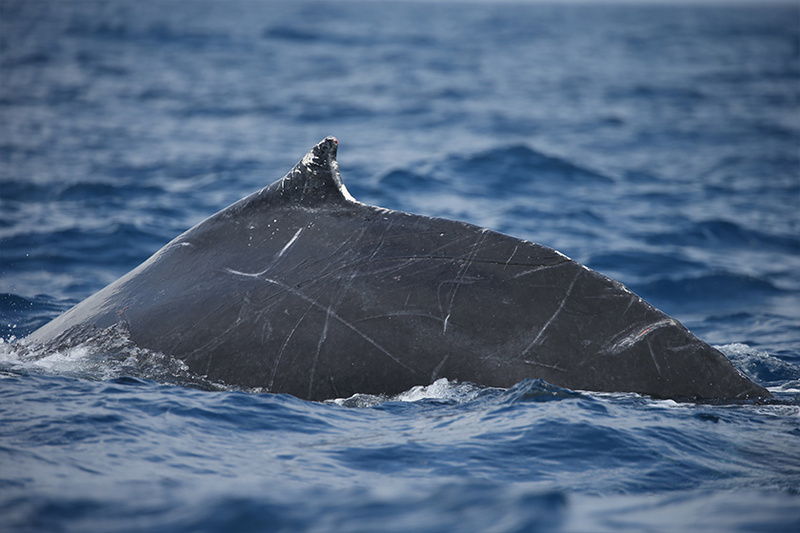 Dorsal fins are often damaged in rowdy groups, and their shape (along with scarring) are one tool used to identify individual whales. Humpback whales have extraordinarily long pectoral fins, nearly one third the length of the whale. 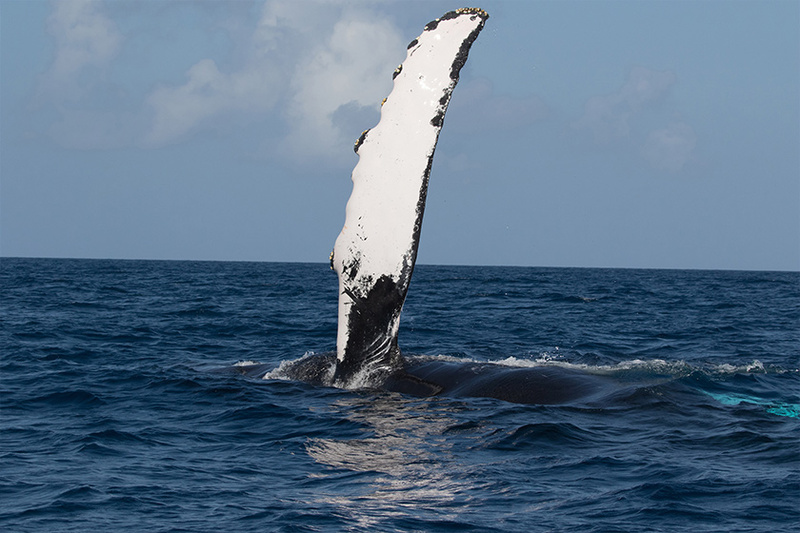 The length and shape of the pectoral fins facilitate the graceful movement humpbacks are known for, even allowing the whale to swim backwards and turn on a dime. These long pectoral fins are where humpbacks get their scientific name Megaptera novaeangliae or “big-winged New Englander”. 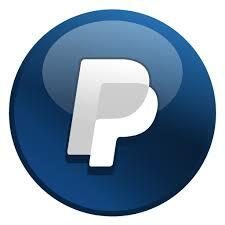 The entire staff was excellent, always insuring that one had the best experience possible.